Nvidia Corp., the biggest maker of graphics processors, gave a disappointing forecast and said a greater-than-expected drop in demand for chips used by cryptocurrency miners put a lid on sales growth. Shares fell about 4 per cent in extended trading. Revenue in the fiscal third quarter will be US$3.25 billion, plus or minus 2 per cent, the Santa Clara, California-based company said Thursday in a statement. That would fall short of analysts’ average estimate of US$3.35 billion, according to data compiled by Bloomberg. 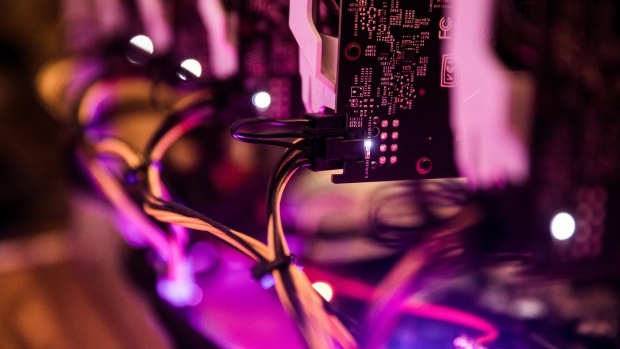 The mining of cryptocurrency tokens such as Bitcoin, computer code that carries value in online transactions, had helped stoke demand for graphics chips. These types of processors excel at making multiple small calculations at the same time, the type of capability that’s well-suited for cryptotoken creation. These graphics chips had been in short supply and prices had risen for their main users, gamers. Nvidia said it had expected about US$100 million in sales of chips bought by currency miners in the fiscal second quarter. Instead, the total was US$18 million and the company projects no revenue from those customers in the future. Investors are expressing their concern at the sudden collapse of what had looked like a billion-dollar business. Three months ago, Nvidia said it generated US$289 million in sales from cryptocurrency miners in the fiscal first quarter, but warned that demand was declining rapidly and might fall by as much as two-thirds. Even that prediction was too high. Nvidia founder and Chief Executive Officer Jensen Huang is reshaping his company to take advantage of trends that are changing computing. He has convinced owners of data centers that modified graphics chips are the best solution to handle the surge in artificial intelligence processing that is fueling the growing use of voice and image recognition. Earlier this week, Huang unveiled a new more powerful chip architecture that he said will help Nvidia gain more share in computer intensive industries such as movie special effects and automotive design. Turing, as it’s called, will also make its way into gamer- and data-center chips. While data-center chips now account for a fifth of company revenue and are increasingly a driver of overall growth, persuading gamers they need the latest Nvidia GeForce graphics chips to make their experience ever more realistic remains the company’s main source of income. The prospect of the new design coming later this year may be causing some to hold off on purchases of its predecessor. Still, Nvidia reported that sales from gaming rose 52 per cent to US$1.8 billion in the quarter ended July 29. Data-center revenue increased 83 per cent to US$760 million. Both areas topped analysts’ estimates. Nvidia had a profit of US$1.1 billion, or US$1.76 a share, in the fiscal second quarter, compared with US$583 million, or 92 cents, in the same period a year earlier. Revenue surged to a record of US$3.12 billion. Analysts estimated US$3.11 billion. With the quarter’s results, Nvidia revenue is on course more than double from 2016. Investors have been attracted to the stock, pushing shares up 33 per cent this year compared with a 6.4 per cent advance by the Philadelphia Stock Exchange Semiconductor Index. It’s the second-best performer on the index in 2018 behind rival Advanced Micro Devices Inc.